I came across a super cool video today that merged physics and art in an awesome way. Before you watch it though, I’m just going to talk about the science behind it real quick, ok? 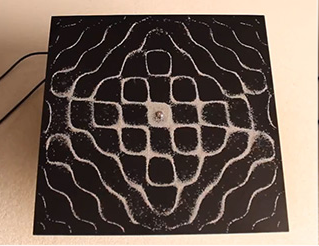 Anyway this video demonstrates the “shapes” of sound waves with nothing more than a speaker, a metal plate and some sand. When a tone is played through the speaker, the metal plate vibrates… and the vibrations are different depending on the pitch of the tone. The sand is there to help us visualize the differences in these vibrations, because it naturally shifts to areas of the plate that are vibrating the least. The resulting patterns are totally cool and beautiful and unique to each frequency. So if you’re super smart and know what all that means, hurray for you (because I don’t). 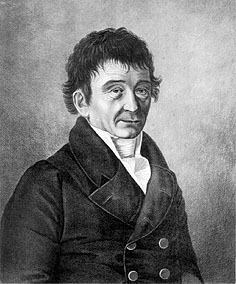 Ernst Chladni is the guy who figured it out, and he was a German musician and physicist. He published his method in 1787 in his book “Discoveries in the Theory of Sound.” Also – FUN FACT! – he suggested that meteorites were of extraterrestrial origin rather than volcanic (as was believed during his time). Not suprisingly that pissed a lot of people off, until one day a giant meteorite was seen falling from the sky over England. Upon testing, mineralogists concluded that “space rock” was probably legit. SO ANYWAY! Back to that awesome video! Just sit back and relax and watch how awesome nature can be… there’s nothing special here, just sound waves made visible with a clever trick… the best kind of science.